I hope you all are enjoying this first term together. I can’t believe we are already at week 5 and most of my Mini-Explorers are already confident with some of the new words we have been practicing during this week. What exciting journey around the market. I love markets, I think they always express a lot about the local culture. I like the smell and the colours of the market. I like to see people shopping and fill bags with different kind of food the one that most suits their diet. I love to see my Mini-Explorers interact with our creative play created around the market to stimulate their verbal and cognitive skills. Discover their preferences about food and see them create our art and craft, inspire me as much as exploring a new market. The appetite of discovering they have is a wonderful expressiveness of imagination. It brings alive the culture around the food and open a window on the table of the world. Looking on our meal it is like to look inside our personality, I think. Sometimes tell us more then a story. I had a lot of fun to find some of the books we are reading this term and my pick is following a crescendo of emotion to bring you to one of our unique props story. I know that I often take a long break from this page but I recommend to visit our Mini-Blog in the following weeks because there are some very exciting news for you. I have looked at the fireworks this year and thought at them such as an explosion of emotion. They have welcomed the beginning of a new year and greet the year behind. Dreams, ideas, love, passion, of all the special moments pass and the one we wish forward. 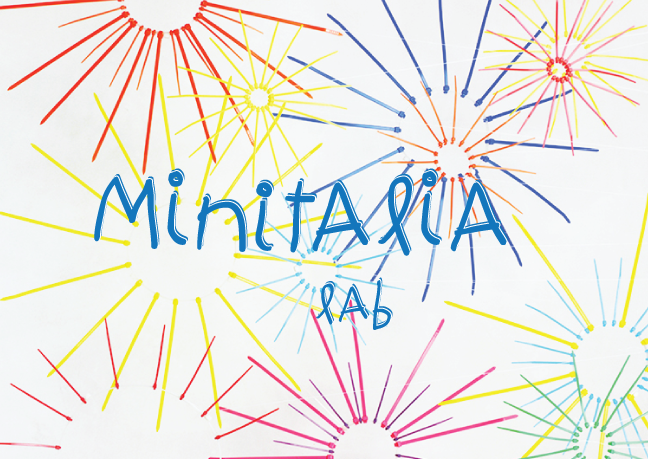 Minitalia Lab celebrate a year of life in 2014 and we happily remember all the fantastic adventures we had during the year. This year of experience has been a stellar start for a new year plenty of surprise. We are so proud of the job we all have done together and what we have achieved so far. The passion that we bring along will never finish to make us to create more and give always the best to our Mini-Explorers. We have designed a new programme that keep alive the job made last year with many new ideas to stimulate the creativity of our children. Minitalia Lab has built a strong personality during this year and has brought to life a unique programme designed and created by us. Our curriculum offers to the children the opportunity to experience a new language and to develop cognitive, sensory and motor skills. Minitalia Lab is also a studio where children can express themselves and understand what they like. 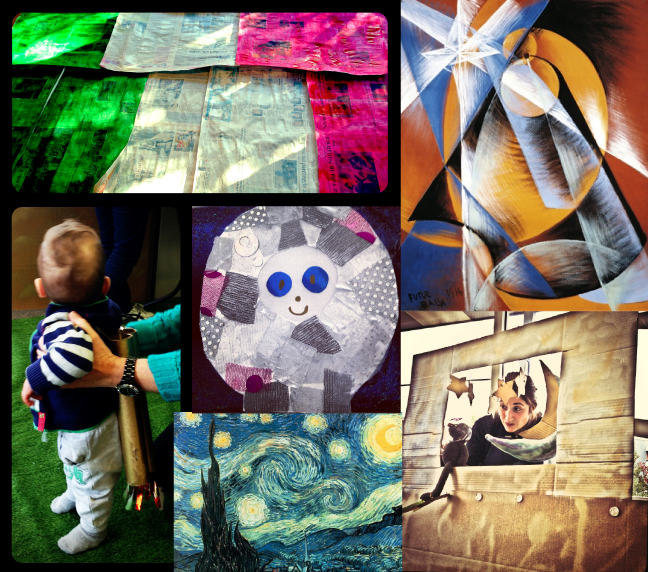 Our workshops are inspired by contemporary artist and we often bring to a new life old artist to provide an inspirational experience and feel the completeness of the world and understand the mystery of life. We love to surround the children with the best atmosphere and the greatest material giving them the most modern tools to listening, watching, experiencing and participating actively to our wonderful trip. 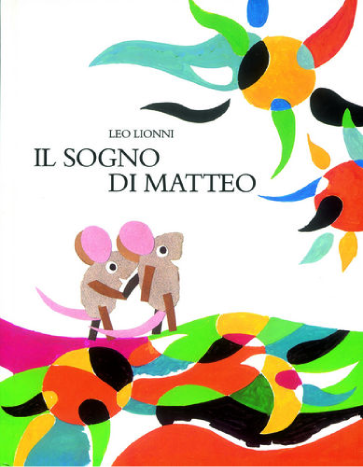 We have updated our material to exchange with our Mini-Explorers thought and ideas by activating all of the senses and multiple intelligences to develop a multidimensional form of Italian. This Term we will invite the children to recognise what they see on the table and how food is part of our life. We will play to make breakfast, lunch, afternoon tea and dinner, in one of the most famous market of Rome. Our Mini-Explorers have always a lot to tell and ask, we try to make of this a story of a joyful life! Are you ready to jump on our Mini-Bus to discover our next stop? Term 1, 2014 is about to beginning. The Mini-Christmas Tree is now ready to wait for our final workshop with Santa Clause. It is almost time for a new year. We have now complete our first year journey together. I would like to thank all the Mini-Explorers from Minitalia Lab to have been part of this fantastic trip. We have so many new adventures for the new year. Timetable for Workshops 2014 are now on the website and I can’t wait to tell you more story and to build more surprise together. We have reserved a very unique programme for you with inspiring new artists to explore and more games to play. So much more to create for a new year together. Minitalia Lab is now launching Gift Voucher, for a very special present for your family and friends. 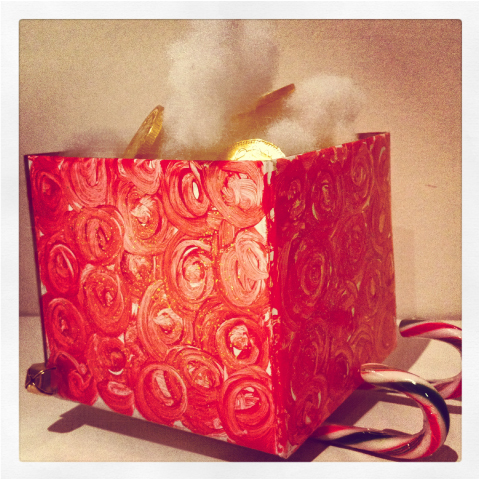 Take the chance to make your present and give something unforgettable to the people you love. Sharing with them the pleasure to discover a new culture and much more, through our creative play in the magic world of Minitalia Lab. 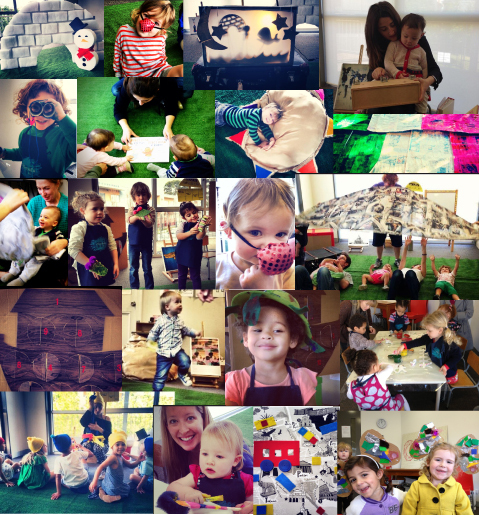 We love to see our Mini-Explorers growing and sharing this pleasure with you. Thanks for all the smiles you gave us during this year, for such a unique present you made to us. This week to support my program to approach the 4 Season I have chosen an amazing book by Blexbolex. An unique experience inside watercolour illustration telling a story of nature by single words. Imagination is the key to explore this book to build the story of what surrounds us during a year of life. Spring, Summer, Autumn and Winter are the commemoration of a whole life from the beginning to the end. I am always inspired from my own life and from the joy and the love I have learnt from my family to give to life. That’s maybe the reason why I believe so much in children. Outside my own room window I have a tree and I have been amazed to look the changes he has gone through the seasons, such as, fighting during the cold winter for a renaissance of a new life. To celebrate life as part of the Christmas workshops and to let my Mini-Explorers discovering the seasons, we will celebrate Spring this week with an unique art and craft inspired from the composition of Antonio Vivaldi. Which exclaim the harmony of the life through the Four Season. I even wanted to express my happiness about the beginning of our program in childcare. 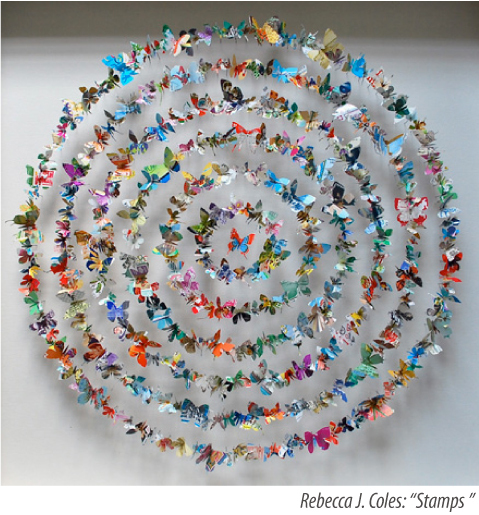 Giving a welcoming to Eltham College Kids on Collins St.
Where we are going to explore an explosive work of Rebecca J. Coles and let fly one of her beautiful butterfly on the Seasons-Tree of Minitalia Lab. A big smile to all of you and enjoy the life! I am so excited about the new Term! 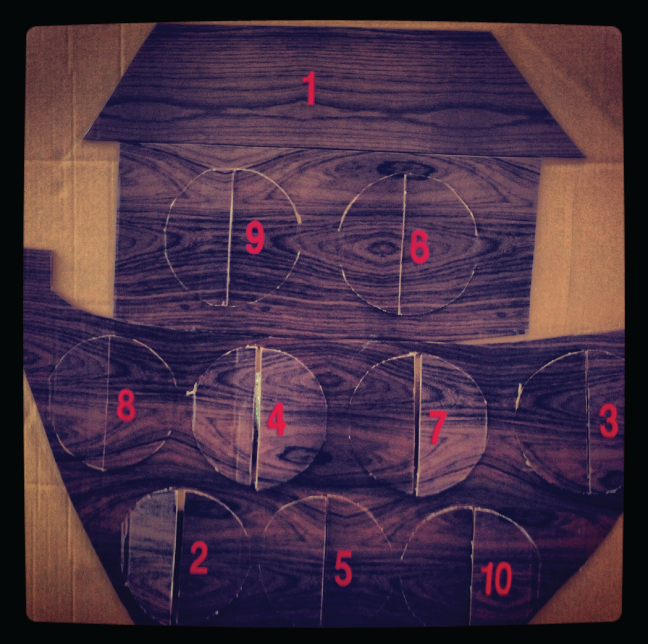 I have created a very exclusive program for our Christmas workshops to keep the magic of this time of the year alive. Life bring along a lot of surprise, sometimes even challenging. Loving life is the secret I think to start the day and explore the world, discover the unknown and beginning a new adventure. Term 4 will be the conclusion of this year and the Lab of Minitalia is full of beautiful surprise as every Christmas deserves! As a native Italian I delight my taste and eyes to discover different tradition and food. My culture keep alive the spirit of Christmas with a very holy feeling. It is a very family celebration and the children are the one that enjoy it better. We love food and is not a secret the time we spend around the table! I think Christmas is one of that festivity that unify the all world , more or less we use similar tradition. Minitalia Lab this term is aiming to translate the Italian spirit of Christmas and share the pleasure and the joy of our traditional Christmas carol and some of the story behind this magic day. An unforgettable trip to the North Pole will lid our Mini-Explorers to meet Santa Claus and of course to enjoy even the treats. A bit of extra sugar will go with our workshops, an encouragement of a very sweet life! So, my dear Explorers this term, open your eyes, your mind, your heart and even your mouth… Santa Claus is coming to town!!! Looking forward to meet you all this week! I have promised to myself different time to write something about our story time. Today after all your request I have finally decided to tell you about our books. I have express already I think in this pages my preferences for the books but, in the last two workshops I have chosen a longer story, because I like to expose my Mini-Explorers as much as possible to the Italian. Story time is the activity that requires apparently more attention. However the sense that is more stimulated is the hearing and even if we are distracted our ORECCHIE keep working. I have been surprised to see how most of the children have responded very well to the longer story and I have to give a credit to some of the Authors and books I have chosen. To promote reading my last week of this Term I have decided to start simulation story to help the children to get into the story and to experience the reading. You will find out more about simulation story next Term, I have enjoyed myself several time in creating short story for my Mini-Explorers and I will dedicate more time on this to offer them a unique journey through story time. Still singing this song, can’t stop to count!! Did you know that there was an Italian version of this song? We sung it all week last week and so many elephants came to Minitalia Lab to dance and make their piece of art inspired by an elephant. We have improved our skills in counting and I can’t believe my Mini-Explorers have already achieved. With the older Mini-Explorers we could count to 20!! Well done everyone!! 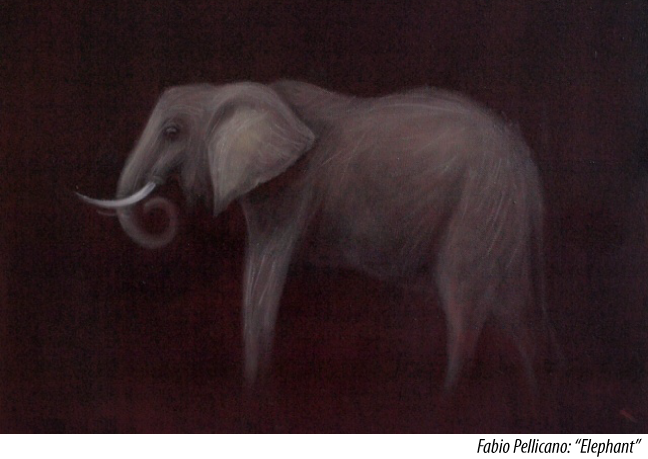 We have started to count from the first elephant showed on the work of Fabio Pellicano, “Elephant” of course. Fabio has dedicated his job to the conservation of the Nature and his series of artwork named “Paradiso Perduto” frame exactly the beauty of wild life. 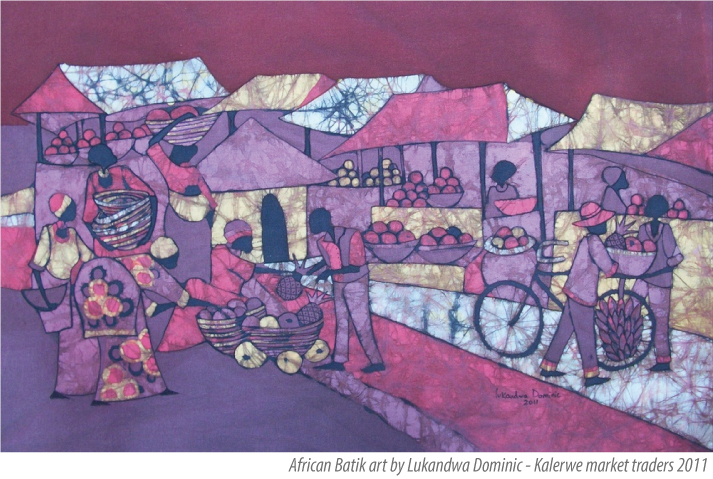 The painting are a real interpretation of the landscape he has been visiting in Kenya. I love the way he can actually stop the image framing in a paint as in a photo… His art is real and genuine as the Nature world. If you want to support Fabio Pellicano’s project and join to “Artists for conservation” enquiry to [email protected]. And now, keep count… more surprise are waiting for us by the end of this term and for the next one. Don’t forget to book your Term 4 Minitalia Lab workshops. It has been a while since we started to row the ark, the Sun has begun to shine and we have met so many animals. The Mini-Jungle is starting to be popular and my Mini-Explorers have discovered so many new Italian words. 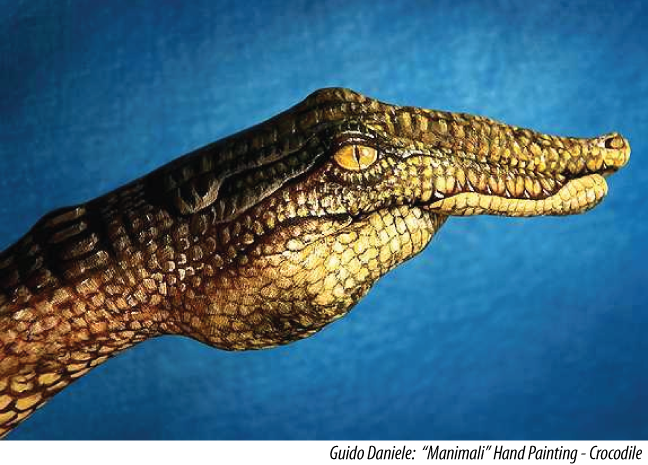 One of my favourite art and craft at the moment is the crocodile inspired by Guido Daniele. The simplicity to animate hand and give to them life has brought a very special toy to MIL to play with. We know the sound of the crocodile and if someone will ask us ‘how the crocodile goes?’ we will know the answer, because what we learn is new! Minitalia Lab give chance to each child to express themselves and the material we are using this term is very inspiring, it has been studied to develop imagination and cognitive skills. Many of the games we made have been created to activate sensory and motor skills. Recycling material from our ordinary day and bring inside the magic world of MIL it has been the way to stimulate all the Mini-Explorers to look for new adventures and to recognise name and object outside the Lab. The ability of children to connect experience is surprising and when experiencing something is fun and natural will be easy for them to recognise the emotion and recreate action. We have made a long journey already and I recognise that this week. My beautiful Mini-Explorers are so engaged in Minitalia Lab activity and I am so proud of you! I am pretty sure my new Explorers will soon get into the world of Minitalia Lab and I am already so exited for our last term together before the New Year. We have saved some of the best surprise for our end of the year, we will travel in a very special and magic land to make your trip with MIL memorable… as usual! A new term is started on the sound of Noah’s Ark. I am not yet a mum but my long experience with children taught me that every day there is something more to learn. And is so beautiful to discover the beauty of life with the little one. It come time when things get harder and when we find difficult to follow our child. It is I think the time they start to look at life with their own eyes and incredible to believe it happen very soon, sooner then we think. I truly believe in my Mini-Explorers, they all have different personality that’s why they move around in different way. I think we are all anxious a bit when we see our little one moving their first step and we would love to make the way smoothly for them. I even think that is the anxious we feel that make us good parents and not the ability to give them a easy life. My Mini-Explorers have a big gift they bring with them as every child… the gift of life that we actually lose a bit everyday… that’s why I want to make everyday at Minitalia Lab a magic day of surprise where doesn’t matter the colour of it or the way you open it. What make the difference is that you are the surprise and you make it special! So let’s row the big Ark of Minitalia Lab through the flood a big rainbow is waiting for us!!! What’s on this week in the Lab of Minitalia? I will start from the beginning of this term because this week is the workshop that will close our term into the Space. Minitalia Lab with all the Mini-Explorers will be engaged in one of our creative game, created to put a flag on the Moon, the beautiful Luna we tried to reached along this term. We have been building a rocketship thanks to one of the best engineer in the whole word, the genius of Leonardo Da Vinci and then we all became Astronauts as Neil Armstrong and flew through the Starry Night of Van Gogh to meet one of the biggest star: the shiny Sun that in the painting of Gianni Balla was so colourful to help us to draw a rainbow. After this and more adventures we have explored during this fantastic term, we moved on the Moon with the sound of “Chiaro di Luna” of Beethoven. This week my workshop has been inspired from Jasper Jones but most of all from the amazing book of Gianni Rodari one of the best Italian writer for children’s books. For his lasting contribution he received the biennial, international Hans Christian Andersen Award. I have chosen the book “Uno e 7”, because tell us about the different colour of the flags and most of all is the first book to tell to children about peace. Term 3 is waiting for us! 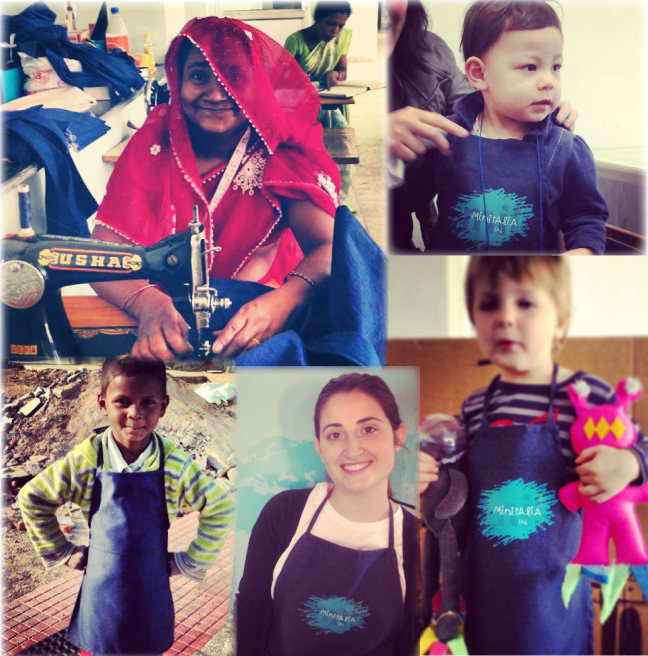 They have been sewn from the amazing hand of the woman of the “Cesar Salai Centre” in Ranchi, India. We have decided to travel so far from Italy this time for our aprons because the Yatra ONLUS (an Italian no profit organization) are building a very impressive project. The philosophy of this organization is: “il diritto a sognare” which mean giving to everyone the right to dream. We love dreams and we want everyone to have the chance to dream. The Cesar Sali Centre, born in a disadvantage village, where people use to live in very pour condition. Now, thanks to Yatra the Centre is becoming strong and allow people to work and make their life upstanding. We are so happy to support this project no as a charity but as a business to another business. Our Mini-Explorers from next term will have the opportunity to be part of this program if you buy one of the Mini-Aprons . We really want to thank you in advance to make this possible and to give to Minitalia Lab the chance to make more dreams come true.